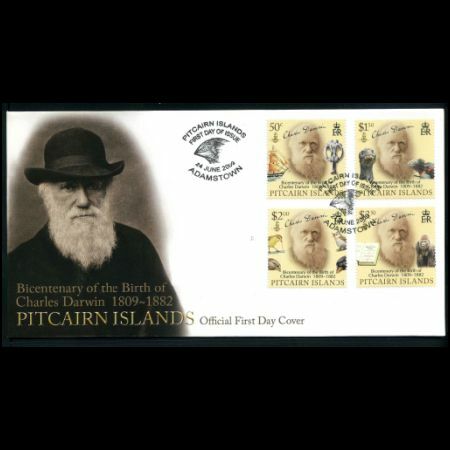 Pitcairn Islands 2009 "Charles Darwin"
2009 is both the 200th Anniversary or bicentenary of the birth of the greatest naturalist in history, Charles Robert Darwin, and the 150th Anniversary of the publication of his most famous work On the Origin of Species by Means of Natural Selection. 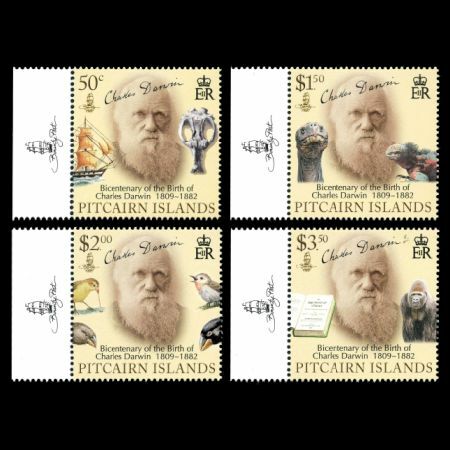 Born in Shrewsbury, Darwin studied at Edinburgh University and Charles Darwin stampsChrists College, Cambridge, before embarking at the age of 22 on a five-year journey to South America, the Galapagos Islands and beyond, aboard the HMS Beagle. At this time, most Europeans believed that the world was created by God in seven days as described in the Bible. 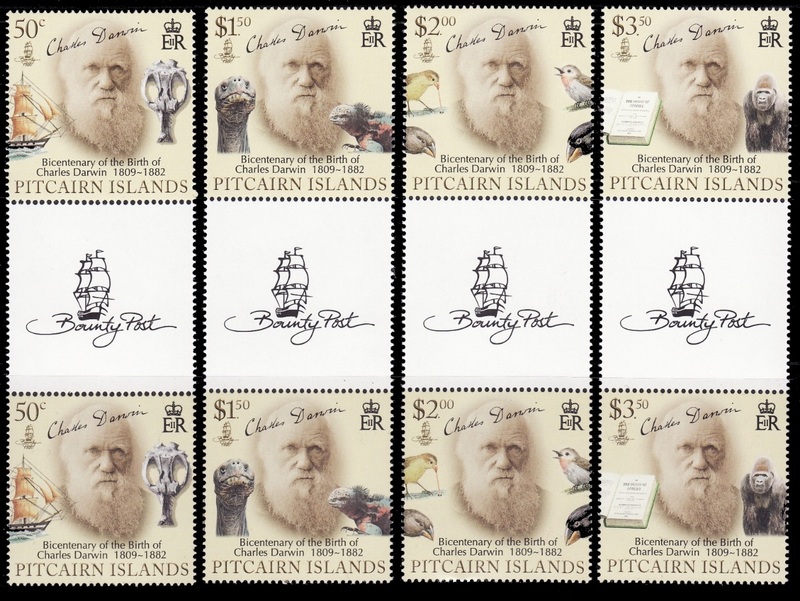 On the voyage Darwin read Lyells Principles of Geology which suggested that the fossils found in rocks were actually evidence of animals that had lived thousands or even millions of years ago. The animal life and geological features that he saw on the voyage reinforced Lyells argument and Darwin linked the fossils to modern species. 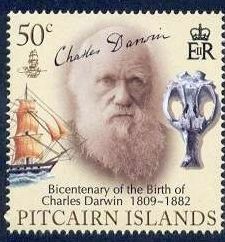 Charles DarwinEvolutionary change was gradual, requiring millions of years. The primary mechanism for evolution was a process called natural selection. The millions of species alive today arose from a single original life form evolving through a branching process called speciation. Darwins theory of evolutionary selection holds that variation within species occurs randomly and that the survival or extinction of each organism is determined by that organisms ability to adapt to its environment. This theory of evolution by natural selection underlies all modern biology. At times controversial, the theory remains unchallenged as the central concept of biology and it profoundly altered our view of the natural world and our place in it. Portrait of Ch. Darwin, ship 'Beagle' at left, fossil Toxodon skull at right. This skull was one of the many spectacular fossils Darwin sent home from South America. Some boys in a remote village in Uruguay had used the skull for target practice and knocked a tooth out with a stone. Darwin bought it from them and was pleased to find a "perfect tooth, which exactly fitted one of the sockets in this skull," 200 miles away. This particular animal belongs to a group without modern descendants, but many of Darwin's fossils seemed to be huge variants of the same general kind of animal he had seen roaming the landscape during his explorations. This led him to wonder if the fossils might be evidence of ancestral forms. In later years Darwin would write that the South American fossils were essential to the "origin of all my views." Paleontologist Richard Owen analyzed the fossil mammals from the Beagle voyage. 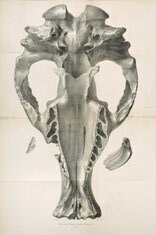 This life-sized lithograph of the Toxodon skull by artist George Scharf was part of the Zoology of the Voyage of H.M.S. Beagle, edited by Darwin. In it the young naturalist described the habitats and behaviors of the living species he had collected, and the localities from which his fossils had come. This book was only part of Darwin's scientific output during the London years. 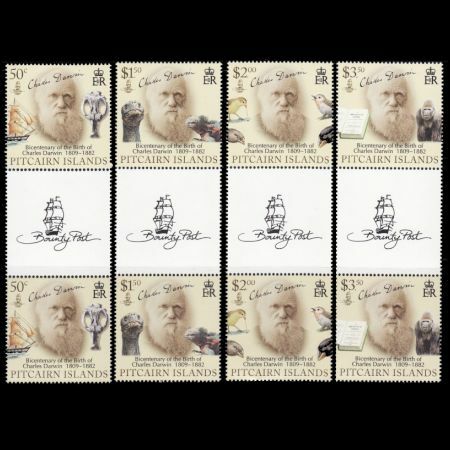 He also wrote a treatise on coral reef formation and the wildly popular Journal of Researches, based on his shipboard journals.